This is going to be a long introduction. Click here to skip to the actual exhibit part. 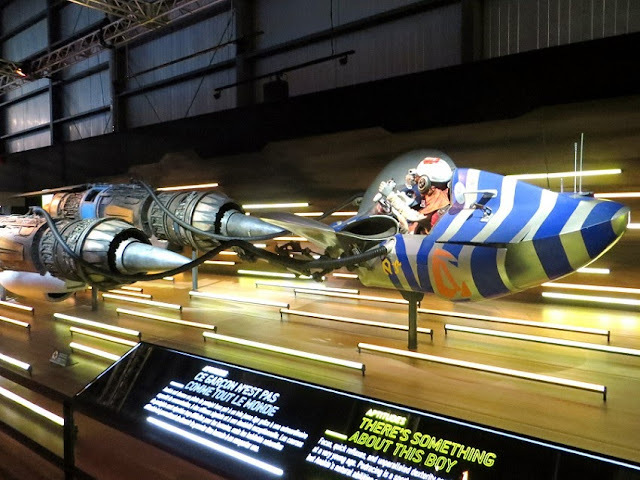 August 2, 2013 — I was standing in front of the podracer that little Anakin piloted to freedom in Phantom Menace. It was about the size of a car and surrounded by fluorescent white tubes of light, like hyperspace lines. 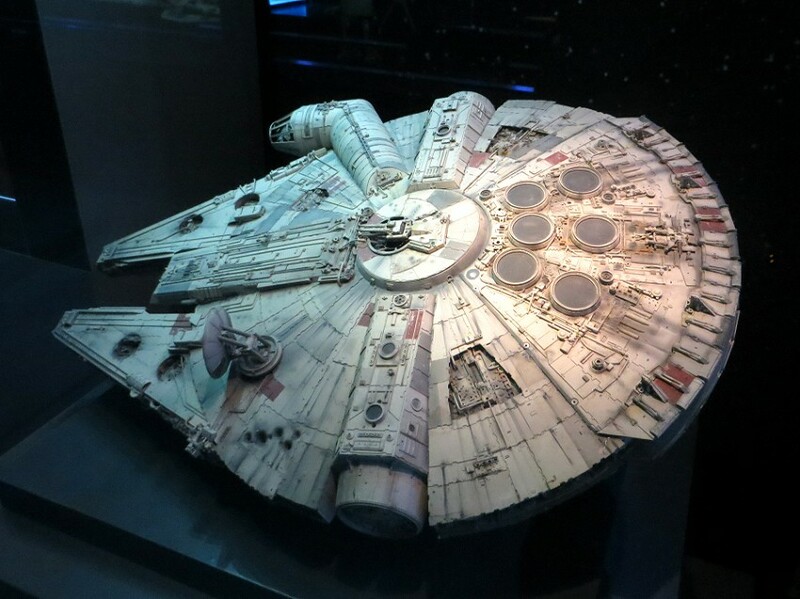 The pod race may be my least favorite scene in all of the Star Wars movies, but looking at the prop, I had to admit…it looked pretty cool. And that was when something I’d subconsciously known for a while made itself blatant to me. Star Wars is just not mine. Hasn’t been for a while. And I’m still kind of getting over that. I was born a month before the original theater run of A New Hope, or as it was called back before it transmogrified into a brand, plain old Star Wars. So only a newborn me knew a world before Star Wars. One of my first memories was seeing Jedi. That memory consists, in total, of a single image carbon-frozen in my brain of a giant close-up of Jabba the Hutt’s beautiful, disgusting blob of a face. 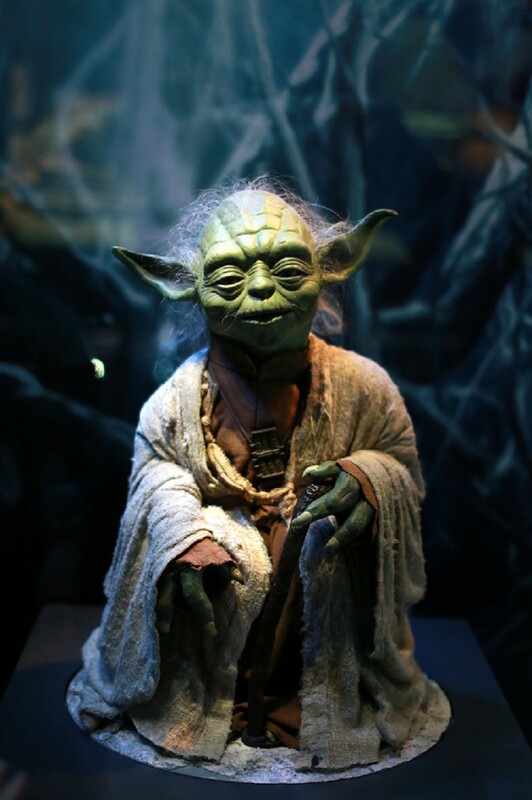 Years and years later, Star Wars turned me on to movies in general, made me aware of popular culture, and fueled a very awkward phase in my life when I thought “He doesn’t like you” was a great way to break the ice at bars and answering the phone with “Red Leader, standing by” was acceptable practice. Star Wars was always incredibly mainstream, but to some of us it was more than a trilogy of movies. We used it as a shared text, a common currency, a shibboleth, a way to connect with other people and stay connected to the people we once were. Even in the relative Star Wars drought of the late 80s and early 90s where nothing Star Wars-ish was really happening and you had to get your fix from dying VHS tapes and magazines at comic book stores, we would hoard Star Wars information and ideas like we knew one day we’d have to stock an entire Internet with them. 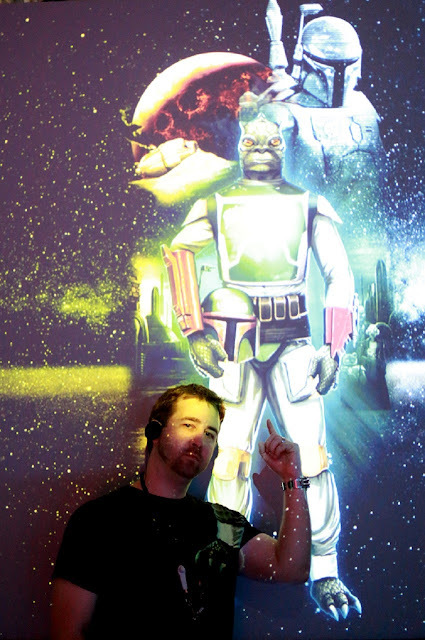 Then Lucas started fiddling with the originals (“Star Wars was never yours.” –Love, GL). And it was kind of exciting again…somewhat heartbreaking, sure, but worth it to see Star Wars in the theater again. To be able to buy a Hammerhead action figure. 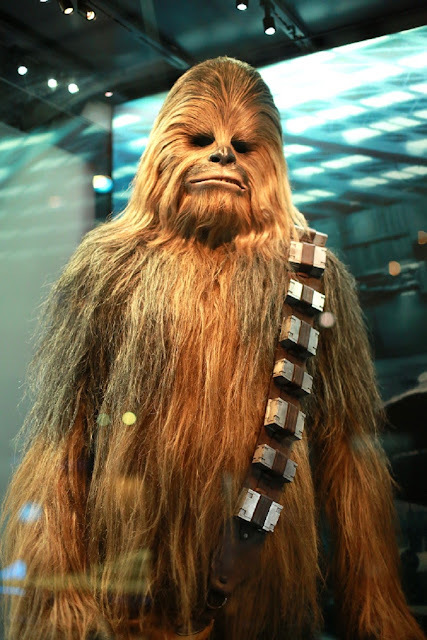 To argue about the location and size of Wookie genitalia and it be part of a national conversation again. And then the prequels finally happened after years of rumors. 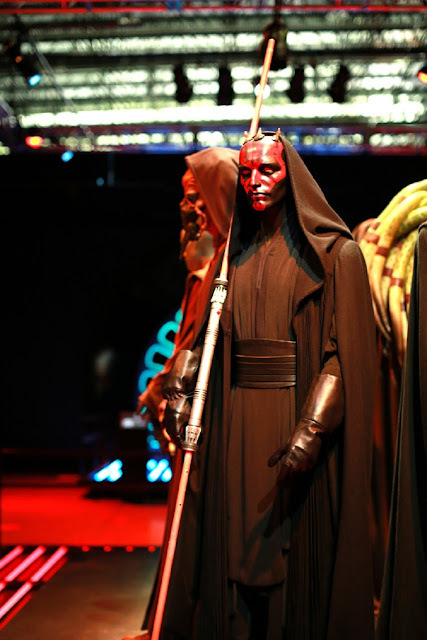 I remember marveling at my first glimpse of Darth Maul in a magazine and watching the trailer over and over again online on a small, boxy Dell monitor with what seemed like the entire dorm surrounding me. It was an exciting time. Like the moments right before the bungee cord breaks. And then they came out. And Star Wars…all of it…was different. Just was. The usual explanation for that shift is that the new movies were bad, a lightsaber scorch mark on the Star Wars universe. And as much as I agree with that, I think I’m about to defend them. See, I have this uncomfortable theory that an underlying, unacknowledged reason so many lifelong Star Wars fans, including myself, have allergic reactions to the new trilogy is not because the movies were bad (per se, per se) or because our long-held expectations were unmeetable. Instead, I think it might have been that the filter of these new movies revealed something painful about the original movies. I mean, story-wise, that’s an obvious point. But I don’t mean we looked at Darth Vader in a new, disappointing way, as a bland character whose mystery had been diffused and whose actions and motives were insensible and lunkheaded instead of tragic. I mean, we looked at the movies themselves in a new way. And I think we learned that those movies, the hallowed originals, weren’t all that. I really don’t like typing that. I mean, we rightly hate the comedy-relief Rastafarian stereotype that is Jar Jar Binks…but we’re okay with the gay English butler that is C3PO? We hate that George Lucas luxuriates in the latest CGI technology…but praise him for being on the cutting edge of special effects back in the day? We laugh at the terrible acting performances of the prequel…because Mark Hamill and Carrie Fisher got nominated for Academy Awards? We hate how cutesy and throwaway the robot armies are, like we didn’t forgive GL for cuddly Ewok forces and inept storm trooper platoons? We disparaged the new movies for their sarlacc-pit-sized plot holes, when the ultimate and most literal of plot holes is that Death Star vent. And we rail against how oversaturated the product is…as if the original entertainment property didn’t set the standard. I could go on, unfortunately. We made a big deal out of something that wasn’t a big deal. And while I sort of believe that’s the secret to a happy life, it really smarts to get called out on it so strongly by the “big deal” itself. Of course, at some point there’s no more comparison. Disney owns Star Wars now and will release a movie every year. In between, there will be multiple Star Wars television series. The amount of merchandise was already enough to choke a rancor. Now it’s enough to pull a Death Star out of orbit. That’s mindboggling in a way, but it’s also very modern. Once upon a time we had to wait for our pop culture treasures. Today, the Internet has sped the creation-consumption cycle up to hyperspace speeds. But that’s for the new generations of Star Wars and pop culture fans to parse. However, I recently found a situation where I can enthusiastically high-five that ten-year-old over no-longer-obscure Star Wars references and carry my Star Wars baggage like it’s an original AT-AT still mint-in-box and ready to tear open: Prop exhibits like Star Wars Identities. I love prop and costume exhibits. I don’t care if I hate or have never seen the movie, I want to see its physical pieces. I remember a long time ago, in a galaxy far, far away going to a movie theater near Disney World and seeing on display in the lobby the dress that Liv Tyler wore in Armageddon. 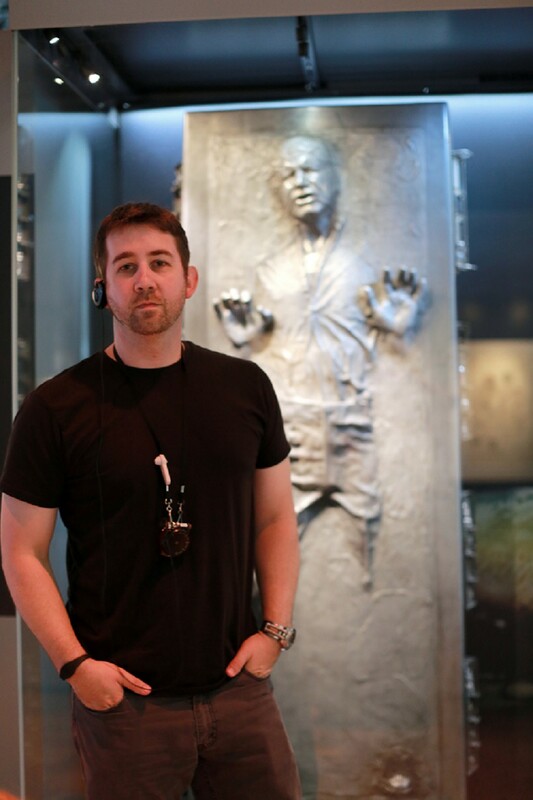 If there’s an absolute worst piece of movie memorabilia in the more than a century of film history, that’s it, but I still stood in front of that thing for a good five minutes, wishing somebody in the world would invent social media so I could post about it in the moment. So when those props are alien masks and spaceship models, many of which are almost 40 years old, of a movie that mutated my DNA during my formative years, well, let’s say I don’t need to do anything else that week for it to be a good one. 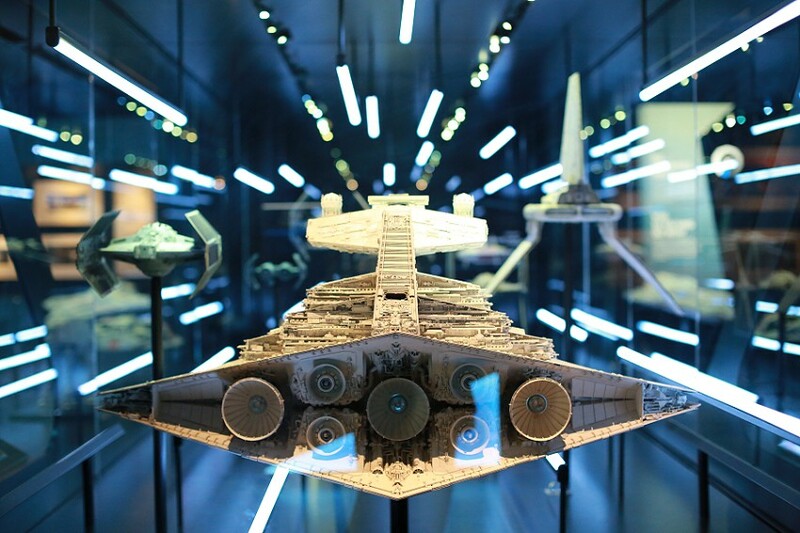 I caught the Star Wars Identities exhibit during its limited run at the Canadian Aviation and Space Museum in Ottawa, so if you see French on any of the placards in the pictures, that’s why. We were part of the first group allowed in on the day that we visited. And I only mention that because it gave us an opportunity to break ahead of the crowd and our own group and have the exhibit all to ourselves. As far as interactive ideas go, this was a good one. I usually hate that kind of stuff, but in this case it was voluntary, unobtrusive, and actually yielded something pretty cool at the end. Nevertheless, we were there to see props. 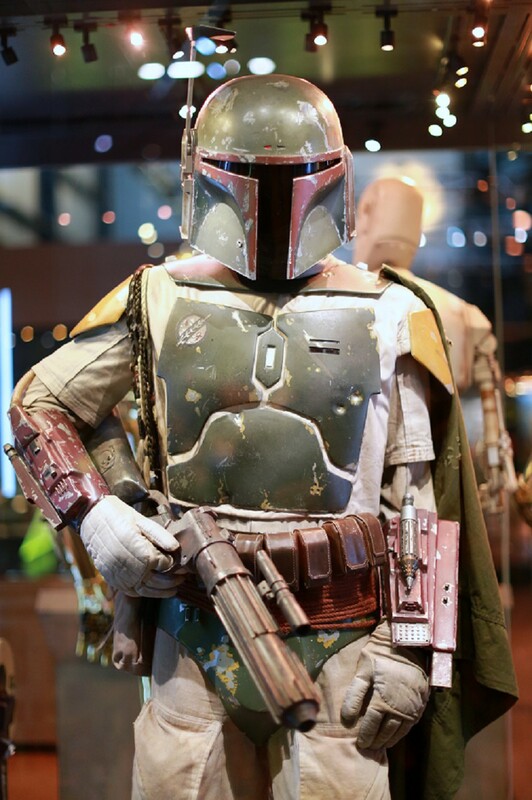 The props and costumes seemed to lean toward the original trilogies…possibly a side-effect of the massive amounts of CGI in the later trilogy, I don’t know. But there was a lot of cool stuff. 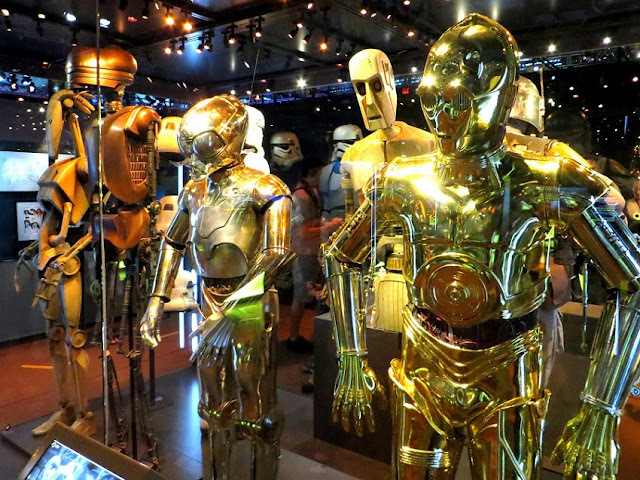 Like an entire display of robots…R2-D2 and C3PO, of course, but also the bounty hunter 4-LOM, a mouse droid, a new-trilogy battle droid, EV-9D9 from Jabba’s palace, and—my favorite—8D8. Even though the latter had only a brief, line-less, terrifying scene at Jabba’s palace as a torturer droid, I had him as an action figure as a child and promoted him to lead villain in many of my bedside Star Wars adventures. I seem to run into R2-D2 and C3PO a lot in my travels. Like here. And here. Other fantastic exhibit pieces included Han Solo in carbonite, a Chewbacca costume, original Ralph McQuarrie drawings, and models of space ships surrounded by those same fluorescent tubes that made them look like they were making the jump to hyperspacee (a way cool effect and a more sensible instance of it than with Ani’s podracer). 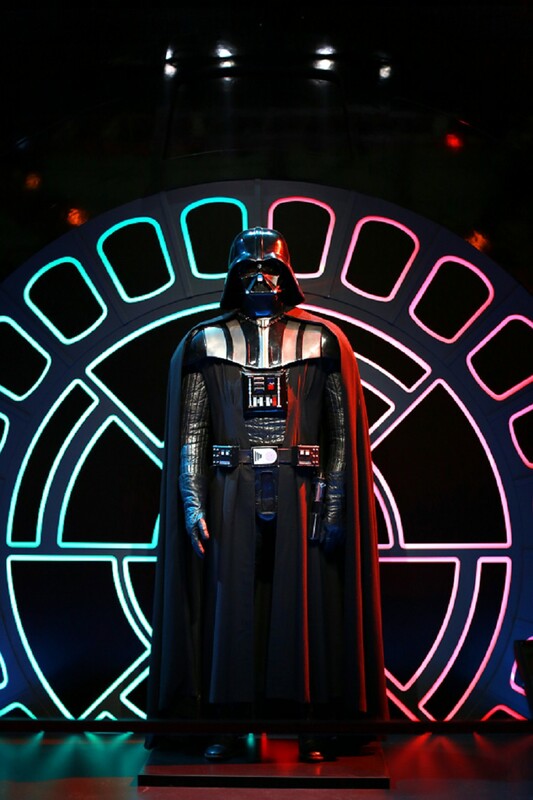 Oh, and Darth Vader himself, circa Jedi if I’m remembering correctly. 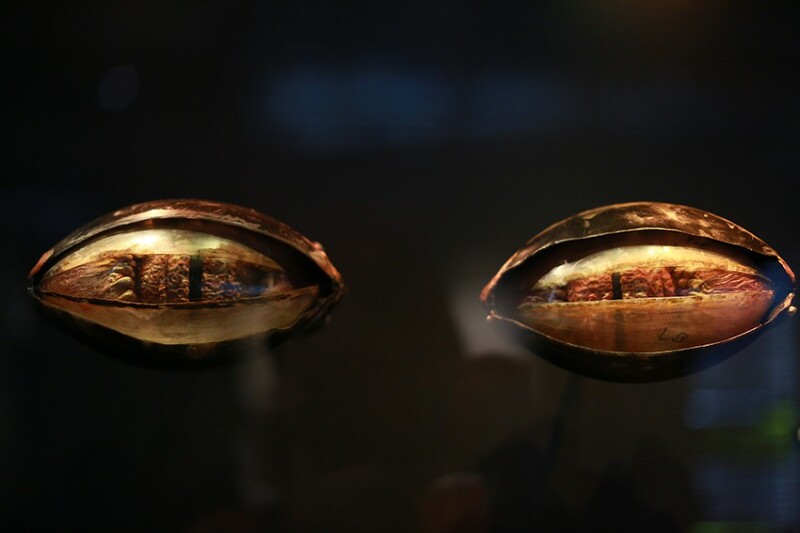 But my absolute, absolute favorite prop was a pair of disembodied (and headed) Jabba eyes. These things were highly detailed, amazingly crafted, and took me right back to 1983, being led up the dark aisle by my parents while that indelible latex mound loomed over us on the screen. The CGI Jabba from the new trilogy won’t leave anything like that behind for posterity. If someone had recorded me traversing the exhibit, I would have looked liked that aforementioned mouse droid running spastically from a Wookie, speeding from exhibit to exhibit, not stopping to listen to the audio tour, just exulting in the sheer physical reality of the pieces and the opportunity to pretend Star Wars was still Star Wars to me. Now, there’s a lot of ways to criticize my criticism in the introduction of this piece, if that’s how you wanted to characterize it. You could take the stance that Star Wars is a much more vast universe of properties now, big enough for anybody to find their niche and enjoy it. And that’s true and cool. You could say that the new trilogy and movies are irrelevant to the old ones (but then you’d have to close your eyes during the blue ghost scene at the end of Jedi). But otherwise that’s true and cool, too. And you could say (and be impeachably correct) that it’s going to be a ton of fun to see the original actors in the upcoming movies, which are in turn now owned by an entertainment company that excels at telling good stories when they want to. And that’s also true and cool. But all that’s never what Star Wars was to me. Star Wars was a touchstone, my major touchstone for so long…and today it’s been rubbed so smooth as to be of little use to me personally. 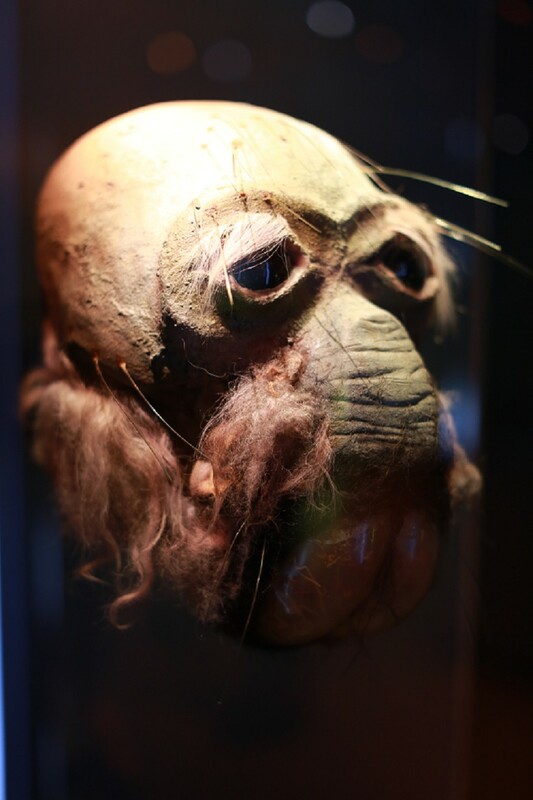 But goddamn it’s still cool to see Ponda Baba’s severed head up close. This is my Star Wars identity. 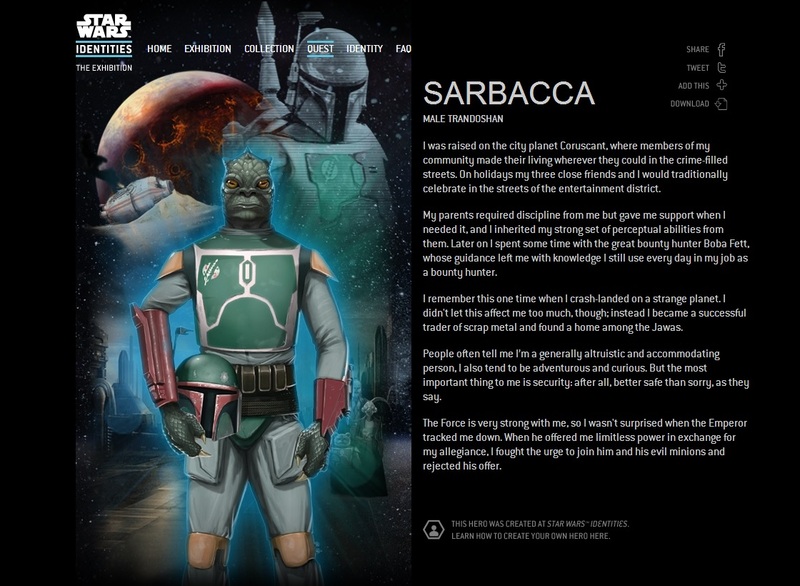 His name is Sarbacca. my wristband, and they emailed him to me, as well (see below).